Yoga, an ancient art, is great not only for the mind but for the body as well. Along with adults, even the children can benefit immensely from this therapeutic practice. 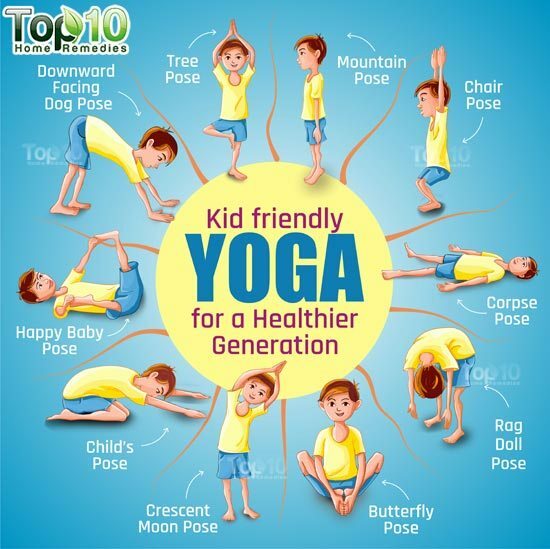 In fact, the yoga is tremendously beneficial for children as it promotes neuromuscular development, improves body awareness and offers basic stretching and strengthening. In addition to this, yoga also helps maintain flexibility, strengthens a growing body, enhances concentration, cultivates a relaxed state of body and mind, helps with stress management, sparks creativity in young minds, and teaches discipline and responsibility. 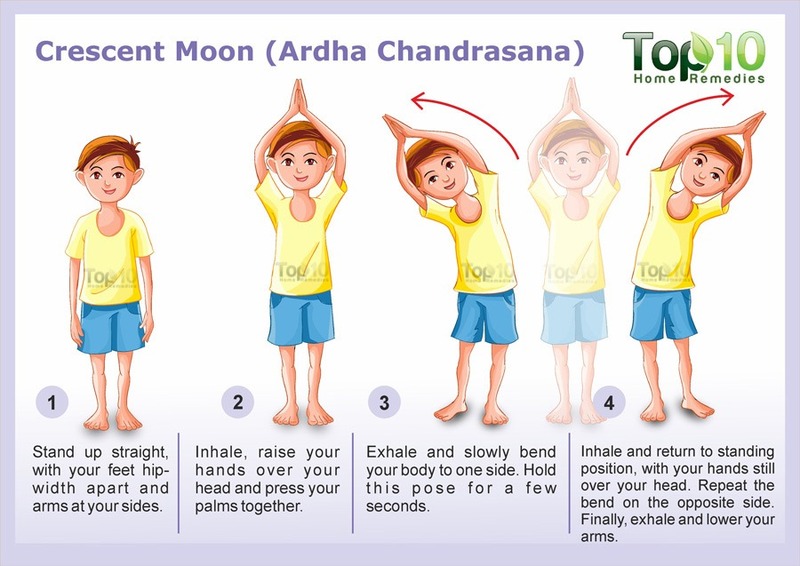 If you plan to teach your children yoga, then do not worry about practicing it perfectly. You need to focus more on helping them practice gentle movements that feel comfortable and help them increase their body awareness. You also need to teach your children that yoga is not a destination; rather it is a lifetime journey that can help them lead a healthy life in the coming years. Here are 10 yoga poses for children. 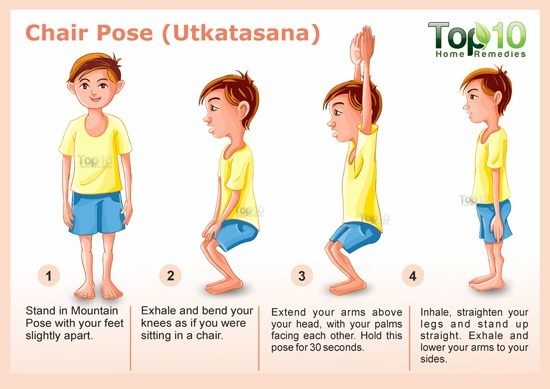 This is a simple yet powerful yoga pose for good posture and increased height. It even strengthens the core and leg muscles as well as reduces flat feet. This basic standing pose is a great foundation for other yoga poses. Stand up straight, with your big toes touching and heels slightly apart. Lift your toes and gently sway back and forth. Gradually bring the swaying to a standstill, with your weight balanced evenly on your feet. Tighten your thigh muscles, lift your knees and pull in your belly. Press your shoulder blades back, widen them across and release them down your back. Chair Pose is another easy one for children to learn. When done properly and consistently, Chair Pose strengthens muscles, develops core strength, protects the knee joints from injury, improves breathing, and stretches the shoulders and chest. It is also beneficial for those with flat feet. Stand in Mountain Pose with your feet slightly apart. Exhale and bend your knees as if you were sitting in a chair. Extend your arms above your head, with your palms facing each other. Inhale, straighten your legs and stand up straight. Exhale and lower your arms to your sides. Repeat 10 times, once daily. In the beginning, you can have your child do this pose against a wall or lift their arms parallel to the floor instead of above their head. This is a fantastic pose for preventing injury and your child will enjoy it just because of its name! It helps release tension in the neck and shoulders, stretches leg muscles and relieves stress. It also calms the mind and makes the child feel refreshed. Stand up straight, with your arms extended above your head. Exhale, bend your body forward and allow your arms to fall toward the floor. Let your knees bend slightly and gently sway your head and arms from side to side. Take deep breaths, allowing your arms to sink closer to the floor. After a few minutes, slowly roll back up to standing position. 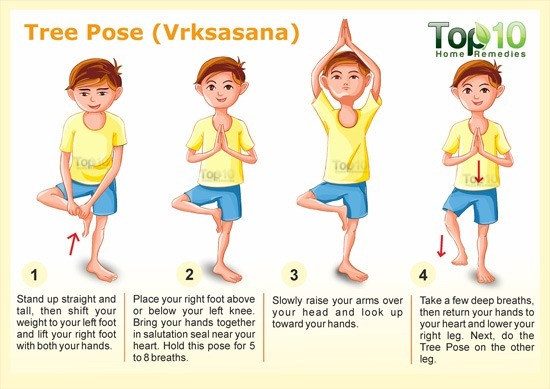 When it comes to the best yoga poses for children, you simply cannot ignore the Child’s Pose. This is a restorative pose that helps release stress. It also stretches the muscles of the lower back, hips and thighs. 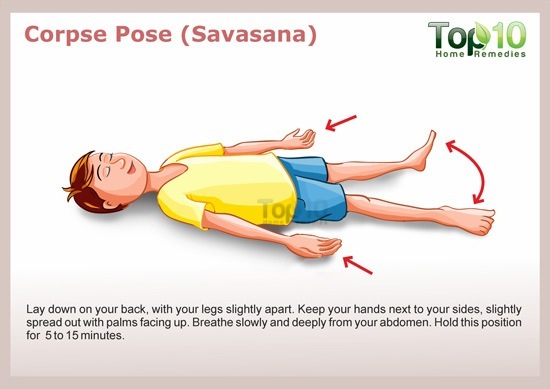 In addition, this pose has a calming effect on the central nervous system. Kneel down on the floor with your big toes touching together. Sit back on your heels, and keep your knees hip-width apart. Exhale and bring your chest to rest on top of your thighs. Stretch your arms out in front of you or tuck them in by your sides. Relax and breathe deeply, holding this pose for 1 to 5 minutes. This standing balance pose requires stillness and concentration that helps calm a frustrated mind. This pose improves balance, develops concentration, stretches leg and chest muscles, and makes the thighs, calves and ankles strong to prevent injury. Stand up straight and tall, with your feet hip-width apart and your arms by your sides. Shift your weight to your left foot and lift your right foot with your hand. Place your right foot above or below your left knee (depending on your comfort level). Bring your hands together in salutation seal near your heart. Hold this pose for 5 to 8 breaths, then slowly raise your arms over your head and look up toward your hands. Take a few deep breaths, then return your hands to your heart and lower your right leg. Next, do the Tree Pose on the other leg. Note: You can support yourself against a wall in the beginning to learn this pose. This pose stretches the shoulders, legs and spine while building strength throughout the body. It also relieves fatigue, rejuvenates the body, boosts immunity, aids digestion and improves circulation. Place hands and knees on the floor. Keep your palms flat on the floor with fingers spread out in front of you. Exhale, lift your knees away from the floor and lift your hips to form an upside-down V pose. Hold this pose for a few minutes. 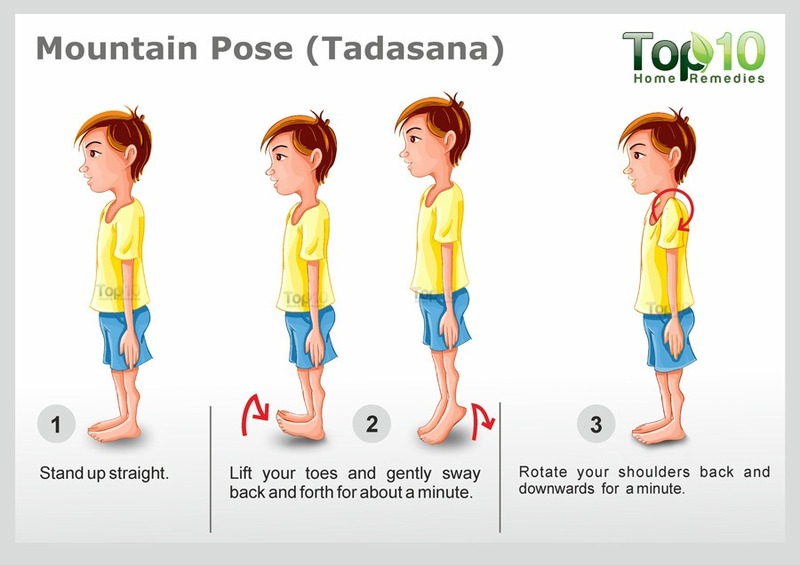 Relax in Child’s Pose for a minute, then stand up slowly. Children love to do this simple exercise and you can teach them with minimum instructions. This pose targets the legs, helping to relax and stretch the muscles. In addition, it aids digestion, relieves fatigue and improves flexibility in the hip region. Sit on the floor with your spine erect and legs straight out. Bend your knees and bring your feet inwards. Place the soles of your feet together and hold your feet tightly with your hands. Inhale deeply, pressing the thighs and knees down toward the floor. Keep your breathing normal and flap both legs up and down like the wings of a butterfly. Start slow and gradually increase the speed. Slow down and then stop. Take a deep breath in and breathe out as you bend forward bringing your nose toward your toes as best you can without forcing the posture. Take long, deep breaths and relax the muscles of your thighs. Slowly straighten the legs out in front of you, give them a little shake, and then relax. This pose greatly benefits the spine. 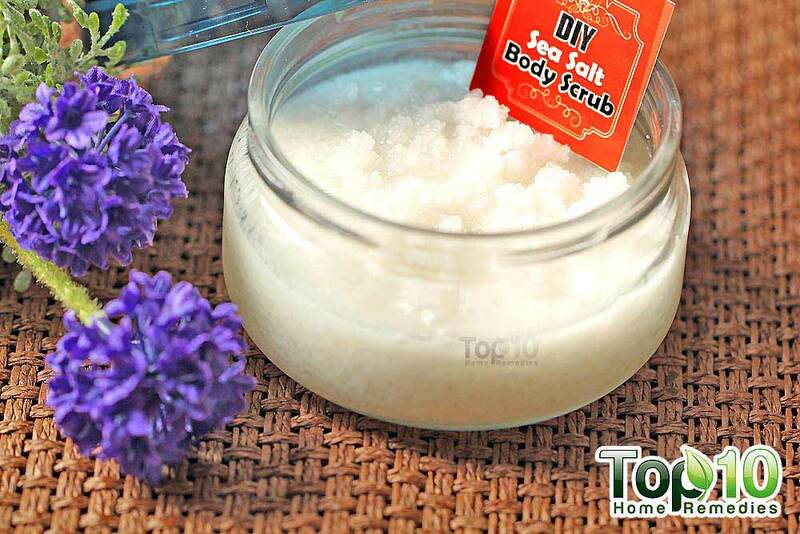 It gently stretches the inner groins, calms the mind, and relieves stress and fatigue. In addition, it opens the hips, which is great for the body. Lay down on your back in a comfortable place. Inhale and pull your knees toward your belly with your hands. Exhale and hold onto the outsides of your feet. Inhale and open your knees as wide as possible. Place each ankle directly over each knee, so that your shins make a right angle to the ground. Flex your feet and try to draw your knees toward the floor. To get out of the pose, exhale and slowly release your feet and place them on the floor. Note: Try to keep your tailbone on the ground during this pose. This yoga pose deeply stretches the sides of the body. It improves core body strength, balance and concentration as well as circulation. It even calms the mind and energizes the entire body. Stand up straight, with your feet hip-width apart and arms at your sides. Inhale, raise your hands over your head and press your palms together. Exhale and slowly bend your body to one side. Your body should form a crescent shape from hands to feet. Hold this pose for a few seconds. Inhale and return to standing position, with your hands still over your head. Repeat the bend on the opposite side. Finally, exhale and lower your arms. No yoga session is complete without the final pose – the Corpse Pose. This pose gives the body time to process information and is designed to rejuvenate the body, mind and spirit at the end of a session. Lay down on your back, with your legs slightly apart. Keep your hands next to your sides, slightly spread out with palms facing up. Breathe slowly and deeply from your abdomen. Hold this position for 5 to 15 minutes. To come out of the pose, take a few deep breaths and roll over to one side. Slowly bring yourself back up into a sitting position. Hagen I, Nayar US. Yoga for Children and Young People’s Mental Health and Well-Being: Research Review and Reflections on the Mental Health Potentials of Yoga. Front Psychiatry. https://www.ncbi.nlm.nih.gov/pmc/articles/PMC3980104/. Published 2014. Galantino ML, Galbavy R, Quinn L. Therapeutic effects of yoga for children: a systematic review of the literature. Pediatric Physical therapy. https://www.ncbi.nlm.nih.gov/pubmed/18300936. Published April 2008. Folleto JC, Pereira KRG, Valentini NC. The effects of yoga practice in school physical education on children’s motor abilities and social behavior. International Journal of Yoga. https://www.ncbi.nlm.nih.gov/pmc/articles/PMC4959326/. Published 2016. Reidy, Dani. Educating Young Children: Learning and Teaching in the Early Childhood Years. Educating Young Children. https://search.informit.com.au/documentSummary;dn=065831269069241;res=IELHSS. Published 2010. School-based yoga can help children better manage stress and anxiety. Tulane University. https://www.sciencedaily.com/releases/2018/04/180410100919.htm. Published April 10, 2018. 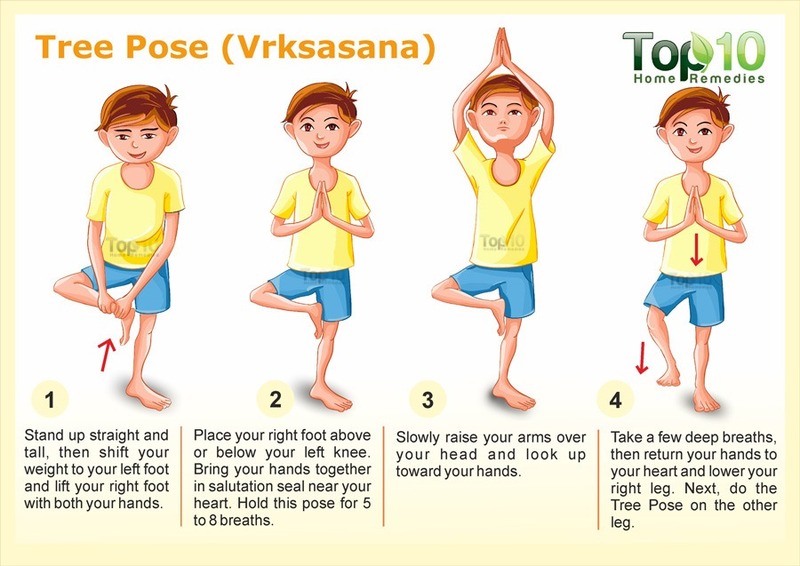 Nanthakumar C. The benefits of yoga in children. Journal of Integrative Medicine. https://www.sciencedirect.com/science/article/pii/S2095496417300171. Published December 14, 2017. Yoga is such a great idea for kids as it promotes relaxation and stress relief, and too many young kids these days are stressed! It also teaches lifetime healthiness. Thank you for this great resource. It helped me as I prepared a middle school lesson on yoga.